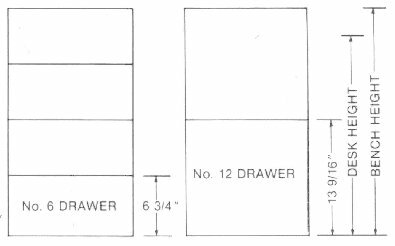 #3 Drawer Body is 2" x 12" x 26"
#6 Drawer Body is 5" x 12" x 26"
#12 Drawer Body is 9-1/2" x 12" x 26"
2" x 27"w x 26"
5" x 27"w x 26"
9-1/2" x 27"w x 26"
All cabinets are constructed of rugged furniture grade steel. Full width recessed anodized aluminum drawer and door handles. Full 1-1/8" thick double wall door and drawer fronts. Precision drawer slide mounts allow interchange of drawers in the field. 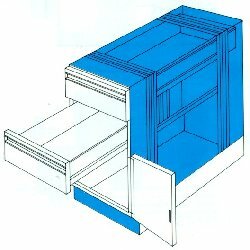 Rigid internal frame structure to maintain a true and square cabinet. Removable rear access panel with electrical knockouts. High quality, durable finish in attractive colors. All drawers are on precision ball bearing slides for effortless, silent operation. Security key locks may be installed at the factory. Single lock assembly on 1000 and 1100 series cabinets secures drawers and door. Note: 1200 Series cabinets require a separate lock for doors. Cabinets fully assembled and boxed when they arrive at your facility. Easy modular installation at your site.